This one gets a firm four stars from me. I probably wouldn't have read it if I hadn't won it from Goodreads' Firstreads. I got an advance copy to look over and review for promotional purposes. 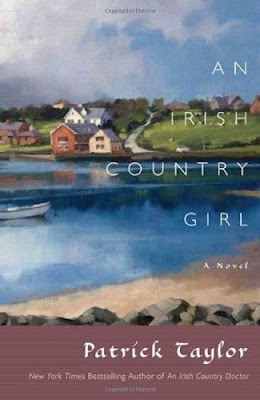 I had not read all the books in the Irish Country series, but I did read the one just before this, An Irish Country Christmas. I liked that one okay, but not enough to make me want to read the rest of the stories. This one, though, was more my cup of tea. I'm really glad I didn't miss out on this story. It is the back story of one of the secondary characters from the series. It has a lot to do with Irish folklore and superstitions and such. Taylor does a great job of bringing you into the story. I found myself thinking about the characters whenever I wasn't reading it. At the same time, it was a light and easy read. He also does a great job in making sure each book in the series can stand on its own. You don't have to have read any of the other books to "get" it. I loved the folklore and I loved the Irish dialect. It was so much fun to spend time there. And this one is squeaky CLEAN! I like it a lot. I have An Irish Country Doctor on my TBR pile. I do not know why I have not read it yet. After reading your post I will bump it up on my list. Congrats on the win by the way! Did you sign up to win? I did not know you can win books on Good Reads. I will have to check it out. That is so cool that you won this book. I haven't checked that possibility out either on Goodreads. I'll have to consider reading this or the first one as I understand about needing the background. In fact, I haven't read anything Irish in a long time. Which is the first book of this series then? Also, welcome SariJ! Thanks for reading 5-squared.